Layout: Circular layout typical of most Federation starships, the Prometheus class Bridge sports some of the most advanced technology and command-capabilities. The fact that the Prometheus class was mainly designed for combat was reflected in the design of its main bridge. The bridge was obviously designed with efficiency in mind, providing the commanding officer with visual access to all major stations when seated in the command chair. Directly in front of the captain's chair, sunken down with three steps, was the location of the operations manager and conn stations, combined in one large console. Both officers shared an unobstructed view of the main viewscreen with the commanding officer. All other stations were mounted against the wall, running around the entire length of the room. Directly aft of the captain's chair was the master systems display, and to the captain's left and right were doors that both provided access to a turbolift and deck one, respectively. As of stardate 56201 (2379) the bridge of the Prometheus had undergone minor refits including the replacement of the Captain's chair with the new mark seven command chair; with independent inertial dampening, saftey restraints, and arm-mounted computer interfaces. 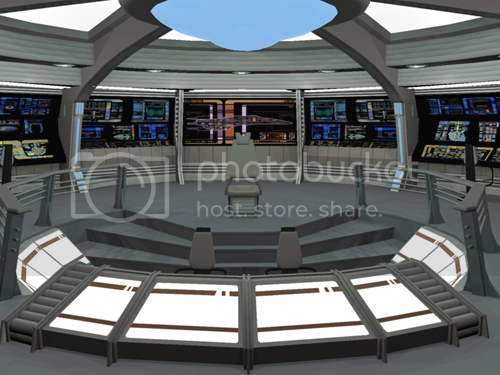 During the refit a dais raised one step above the main level of the bridge was installed to serve as a base for the Mark Seven command chair. 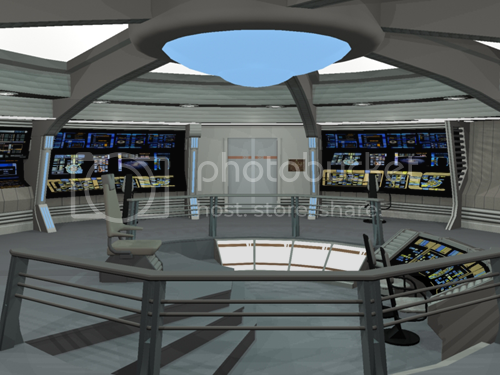 The rest of the bridge refit consisted of a significantly larger viewscreen and master systems display, the addition of consoles facing the viewscreen to the two forward most stations on the bridge's main level, and the addition of two bridge weapons lockers located in the deck in front of the environmental control station and mission operations stations the controls for which were located on the tactical station, First Officer's station, and Captain's chair command interfaces. Due to the fact that the Prometheus is able to split into three separate sections two auxiliary bridges were included during the construction of the ship for use when each section is acting independently of the others. One of which is located in the middle or Beta section and the other is located in the lower or Delta section. Each of these battle bridges are fully equipped command centers which can, if the need should arise, take over control of the main bridge functions. The design for battle bridges of the Prometheus were a re-use of the design for the main bridge of the Defiant-class. Since each section of the Prometheus is a pure combat design, the designers felt that there was no need to design a new battle bridge since the design for the Defiant class' bridge was more than suitable for the task. The Prometheus' main engineering is visually identical, and from an engineering standpoint nearly identical, to that of the Intrepid class' due to the fact that the two classes share common elements and some design lineage. The main difference between the two types on engineering are the corresponding changes for and to the Gravimetric Field Displacement Manifold, more commonly known as the warp core, due the multi-vector assault mode. The Prometheus is also equipped with two Auxiliary Engineering compartments which serve as "main engineering" departments for their sections when the multi-vector assault mode is initiated/engaged. These sections are not as large as the Main Engineering compartment because of their secondary nature, but are none the less more than adequate to serve as a temporary main engineering when the multi-vector assault mode is engaged or if main engineering is somehow disabled/inoperative. To further enhance this each of the engineering compartments is equipped with over-ride circuits specifically designed to allow the remote control of the other engineering sections. Typical crew complement in Main Engineering consists of three engineers and nine technicians of various grades. During Red or Yellow Alert, that number is increased. This multi-room department is located in a restricted area on Deck 4. 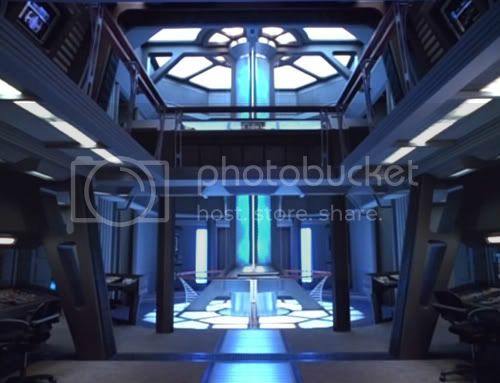 Within it are the entrances to the phaser range, the auxiliary weapon control room and to the Ship's Armory, as well as the office of the Chief of Security. Security Office: The Chief of Security’s office is decorated to the officer's preference. 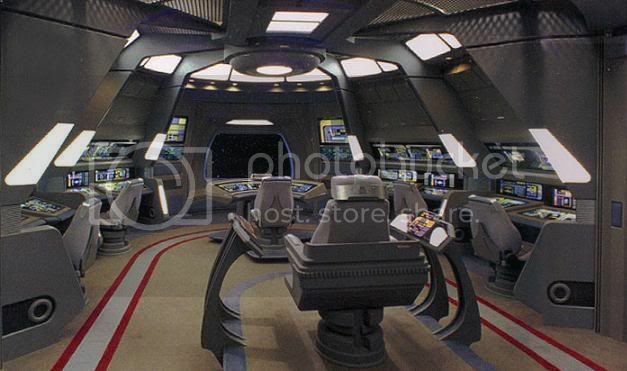 It contains a work area, a personal viewscreen, a computer display, and a replicator. Tactical Office: The Chief of Tactical's office is decorated to the officer's preference. It contains a work area, a personal viewscreen, a computer display, and a replicator. Main Security Office: Located on Deck 4 the multi-task office is used by both Tactical and Security crew for general meetings, shift assignments/reports and contains the auxiliary weapons control, internal shield control and internal sensors. Brig: Located on Deck 5, the brig is a restricted access area whose only entrance is from within the Security Department on Deck 4. The Prometheus class vessel has four double occupancy cells, which contain beds, a retractable table and chairs, a water dispenser, and sanitary facilities. The cells are secured with a level-10 forcefield emitter built into each doorway. Note: The Prometheus class Starship carries modular units for constructing additional brig facilities in the cargo bays. Internal Forcefields: Controlled from the bridge or from the Security office on Deck 4, forcefields can be activated throughout the ship, effectively sealing off sections of the hallway from the remainder of the vessel. Internal Sensors: Used to monitor the internal security of the ship. They can identify the location of specific crewmembers that are wearing their commbadge. They can be used to determine the general location of any person on board the ship, based on the entry of specific variables by the Tactical officer. Ship's Armory: This room is located in a restricted area on Deck 4 and is under constant guard. The room is sealed with a level 10 forcefield and can only be accessed by personnel with Level-4 or above security clearance granted by the Command staff or Chief of Security. Inside the armory is a work area for maintenance and repair of phasers as well as multiple sealed weapons lockers. The Prometheus class starship carries enough type-I and type-II phasers to arm the entire crew. Type-III phaser rifle and the new compression phaser rifles are available as well, but only in enough numbers to arm approximately 1/3 of the crew. Heavy ordnance is available in limited numbers. Personnel Phasers range in power settings from 1 (Light-Stun) to 16 (Atomize).